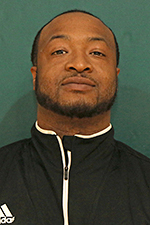 Robert “Bobby” Taylor begins his fourth season as the Paris Junior College’s men’s basketball coach. Prior to PJC, he served as assistant coach of the men’s basketball team at Texas A&M University - Commerce from 2011 to 2016. In his first three seasons at the helm, Taylor guided the Dragons to a 45-30 overall record, including a 23-8 mark and a No. 18 NJCAA National Ranking during the 2017-18 season. He has sent thirteen student-athletes on to the NCAA Division I level and coached seven All-Region 14 performers: Omar Sherman, Brandon Hollins, Tyshon Rogers, Abrian Edwards, Devin Jackson, Leon Redd and Reggie Tharp. Under Taylor’s tutelage, Jackson became PJC’s single season and career three-point field goals made leader. Taylor served as assistant coach of the PJC men’s basketball team in 1996-98, working under former coach Bill Foy, who led the Dragons to the 2005 NJCAA National Championship and was also named NJCAA National Coach of the Year. 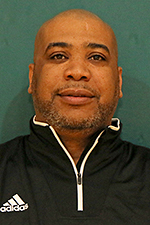 While at PJC, Taylor recruited and coached DeJuan Brown, who was named the 2001 NAIA National Player of the Year while at Oklahoma Baptist University. At TAMU-C Taylor helped lead the Lions to a 24-8 overall record during the 2014-15 season, as well as winning the 2014-15 LSC Tournament Championship and appearing in the NCAA Tournament. In his four and a half seasons with the Lions, they compiled a 79-51 overall record, including going 55-20 (73 percent win percentage) over his final two and a half seasons. During his time at TAMU-C, Taylor helped develop two players with NBA connections: Devondrick Walker, who is currently signed with Pallacanestro Trieste of the Italian LBA, earned the 2016-17 NBA G-League Most Improved Player Award with the Delaware 87ers (affiliate of the Philadelphia 76ers) and played with the Utah Jazz during the 2017 NBA Summer League, as well as with the Philadelphia 76ers during the 2018 NBA Summer League. Darrell Williams, who is currently signed to play with ESSM Le Portel of the LNB Pro A in France, played with the World Champion Golden State Warriors in the 2017 NBA Summer League. Williams was the 2014-15 LSC Player of the Year, LSC Newcomer of the Year, First Team All-LSC, NCAA DII South Central Region Player of the Year, NCAA DII First Team All-South Central Region, NCAA DII First Team All-American and the Texas Association of Basketball Coaches Small College Player of the Year while playing for Taylor at A&M-Commerce. In addition to Williams, Taylor coached nine other All-LSC performers, including former PJC players Desmond King (2012), LaDon Carnegie (2014-15), Anthony Adams (2016) and Ronnie White (2016). Other former All-LSC performers during Taylor’s time at TAMU-C include: Brad Hambrick (2012), Preston Whitley (2013), Devondrick Walker (2013-2014), Christian Macauley was a two-time Defensive Player of the Year (2014-15), and DeAndre Carson earned Freshman of the Year (2014). King and Andrew Davis were named Capital One Academic All-Americans; King was First Team in 2012, while Davis was Third Team in 2012 and First Team in 2013, as well as two-time LSC Academic Player of the Year in 2012 and 2013. Devondrick Walker was named to the 2014 LSC All-Academic Team. Davis and Walker also were named to the NABC Honors Court in 2013. Prior to coaching in Commerce, Taylor was an assistant coach in the Arena Football League with the Oklahoma City Yard Dawgz where three of the players he coached went on to sign contracts with either the National Football League or the Canadian Football League. He also aided the Yard Dawgz in reaching the 2009 AFL playoffs. Before that, Taylor served as an assistant coach at Neosho County Community College, helping lead the Panthers to a 10-win improvement and coaching two Jayhawk Eastern Conference Players of the Year (Mark Gomilla and Antoine Lundy). From 2006-07, Taylor served as Director of Player Personnel for the Arena Football League’s Grand Rapids Rampage. Prior to that he was assistant coach at Texas A&M University - Corpus Christi where he assisted NJCAA Hall of Famer Ronnie Arrow, who won 3 NJCAA National Championships at San Jacinto College and was a two time NJCAA National Coach of the Year. Taylor also spent three seasons at Grand Valley State University, coaching GVSU’s all-time leading scorer John Flynn. Maurice Heade, a native of Detroit, Michigan is in his first year as assistant coach for the Dragons. Heade has spent four seasons as a student assistant. Two of those years was at PJC under former Head Coach Chuck Taylor (2012-2014) From 2015 to 2017 he was student assistant at Texas A&M University-Commerce. While student assistant at PJC, Coach Mo was a part of the 2013-2014 regular-season championship team with a record of 26-8. The Dragons also won the Region 14 Conference Tournament Championship that year, becoming the first Region 14 team since 2000 to win both the regular-season and conference tournament crowns in the same season. While with the Dragons, Heade had the privilege of coaching the 2014 conference tournament M.V.P Trevon Seymore who went on to play at Coppin State University; Delvin Dickson and Jovan Austin who went on to play at Bowling Green State University and Nouhoum Bocoum and Ronnie White who went on to play at Arkansas State University. Coach Mo joined the Lion’s staff in the 2015-2016 season, working with current PJC Head Coach Bobby Taylor who was the assistant coach for the Lions at that time. Heade also had the chance to work with four former Dragons during his time at TAMU-C: Anthony Adams and Ronnie White in 2015-2016, and Trevon Seymore and Jovan Austin in 2016-2017. He played a major role in helping the Lions reach the NCAA Division 2 National Tournament in the 2016-2017 season. Coach Mo completed his Bachelor’s Degree at Texas A&M University-Commerce in 2018.